Compost is every green thumb's secret weapon, and now it'll be yours too. Transform food, lawn, and garden scraps into nutrient-rich "black gold" with Miracle-Gro's Single Chamber Tumbling Composter! Our heavy-duty, all-season composter creates the perfect environment for microorganisms to thrive, turning your food waste into fertile compost that your garden will love. With sturdy construction and attractive, compact design you'll be fertilizing your garden with homemade compost for years to come. Unlike its larger competitors, Miracle-Gro's single-chamber composter is designed to fit even the smallest of spaces, while still offering full composting capability for every home gardener. 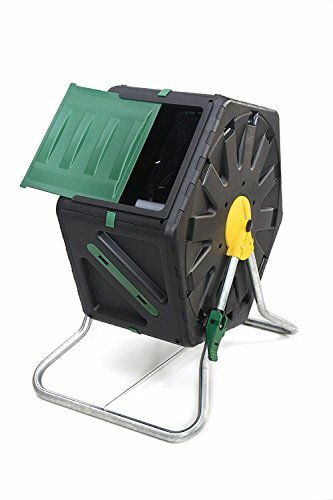 Suitable for urban farmers, rooftop gardens, patios, porches, and tiny backyards, this is the best composter for gardeners with limited space or lower volume needs. Assembled size: 18.1 x 23.6 x 33.1 inch / 46 x 60 x 84cm. Take the mystery out of growing lush, beautiful gardens with Miracle-Gro! Our composter is simple yet effective, making it perfect for beginners and green thumbs alike. The barrel is easy to assemble, and every order includes instructions in 3 languages AND a barcode that links to a YouTube video tutorial, giving you step-by-step instructions to help you build your composter. A gift to make your gardening dreams come true! Accomplish any chore, big or small with a FREE pair of Scotts water-resistant gardening gloves! For a limited time, purchase a small composter from Miracle-Gro and get a FREE pair or latex-free gloves. Miracle-Gro and Scotts are here to help you grow a garden like never before. With 2 of the most trusted names in gardening by your side, there won't be any task you can't tackle! Make your garden blossom and add a Miracle-Gro compost tumbler to your cart TODAY! ✔ NO SPACE? NO PROBLEM! - Don't let tight spaces keep you from composting! Miracle-Gro's outdoor compost bin tumbler is small enough for even the tiniest spaces! The 18.5gal (70L) volume perfectly fits your balcony, porch, patio, or rooftop garden. Finally you can compost from anywhere! ✔ TURN YOUR FOOD WASTE INTO GARDEN GOLD - Transform kitchen and garden waste into rich, fertile compost - the gardener's treasured "black gold!" Ready-to-use compost will be yours in just 4-6 weeks, thanks to Miracle-Gro's unique aeration system. Internal mixing bars speed up decomposition to make growing a happy garden easier than ever! ✔ REDUCE YOUR CARBON FOOTPRINT - Studies show that approximately one third of the world's food supply goes to waste. But with Miracle-Gro's rolling compost box you can do your part to change that. Save your compostable food scraps, help the environment, and cook up some compost that your plants will love! ✔ YEAR-ROUND, HASSLE-FREE - Why should composting be a seasonal activity? Miracle-Gro's heavy-duty design lets you keep your compost going all year round! The sturdy side-locking mechanism ensures easy loading and unloading, while the durable construction maintains a tight seal. And BPA-free, food grade, UV-protected plastic, means you won't need to worry about harmful toxins. ✔ FREE BONUS GIFT - Achieve your garden goals with a FREE pair of Scotts multi-purpose gardening gloves! Each pair is latex-free, water-resistant, and features a no-slip grip, perfect for both indoor and outdoor projects. Grow your green thumb with Scotts and Miracle-Gro! If you have any questions about this product by Miracle Grow, contact us by completing and submitting the form below. If you are looking for a specif part number, please include it with your message.